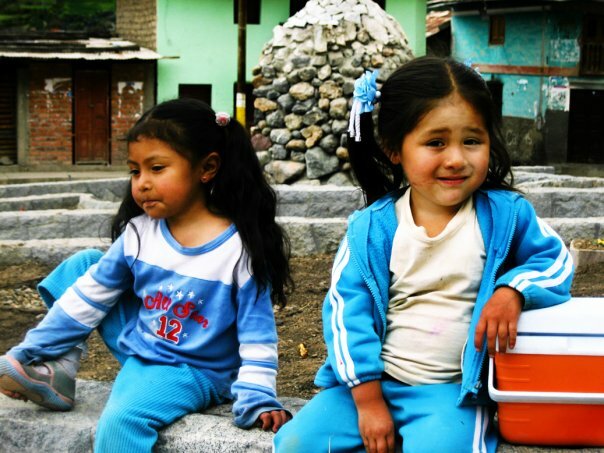 Do you remember these girls? This past September, I shared with you the story of this day; the day I met Poverty. It was this same day that I came face to face with Slavery. This picture was taken in 2009 but the memories are so fresh, I can see, feel, and hear it all, like I’m still sitting there across from them, my heart wrung out and broken. 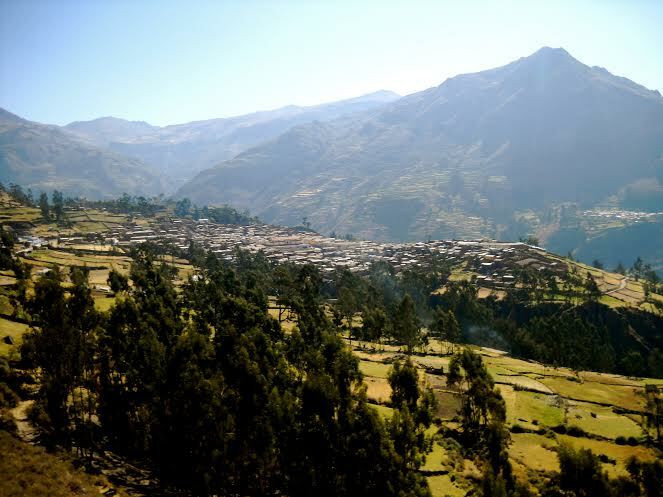 I want you to take a moment and join me, sitting in this small Peruvian village tucked away in the great Andes Mountains. I turned to see a small girl toddling towards me and my friend who was busy chatting with the two older girls. The little one, finally reaching me, placed her hand on my leg to steady herself. She couldn’t have been older than 2. I gave her a little grin and her big brown eyes brightened as she offered back her sweet smile and reached up her arms for me to hold her. Just like that. I looked around for a parent, an older sibling. But no one had accompanied her. So there we all sat, giggling and chatting away. I continued to glance up the road where this young one had come from, wondering where her parents were. A few minutes passed, a few more, then a figure turning the corner caught my eye. An elderly woman began making her way down the rough dirt road towards us. She was wrapped in a colorful wool shawl. Her wrinkles framed her face and the gray highlighted her long dark hair. She sat next to my friend and leaned forward to shoot a quick smile towards me and the little one, telling us she was the grandmother. The parents were gone so it was up to her to take care of the girl now though she had very little money and no other family to help. I listened with one ear, making out what I could in my rusty Spanish. But mostly, I was paying attention to the girls, and letting my friend (who was fluent in Spanish) handle the more advanced-level conversation. I cradled the little one tighter and made a funny face to get her laughing, while the other two giggled along. Then I felt my friend nudge my arm. The woman was speaking directly to me now. I turned all my attention onto her words, concentrating hard to interpret what she was so eager to tell me. Do you want her? You should. She’s a good girl. Do I want her? What do you mean? The girl. Do you want her. I will sell her to you. Till the day I die, I will hear myself fumbling over my Spanish to put that one tiny sentence of defense together. And I will hear her response, and remember how it made my whole body clench up, nauseated by the excruciating reality revealed. Many days I have wondered where she is now. I have dreamt of that day, of holding her, looking into the eyes of her grandmother, fumbling for words, and then being called away to our van that couldn’t wait another minute before leaving the village, having to lift her off my lap, set her down, and then walk away. And all of us weeping in light of what we had learned, of how far the depths and the reaches of evil had travelled. It demands awareness. It demands action. It demands an end. Today is “Shine a Light on Slavery Day.” Many mornings following my dreams of that awful day, I’ve cried out to God with burning questions for the sake of all those affected, the injustice. But I’ve also allowed it to become personal. God, why would you take me through such a horrible, raw experience? What am I supposed to do now? 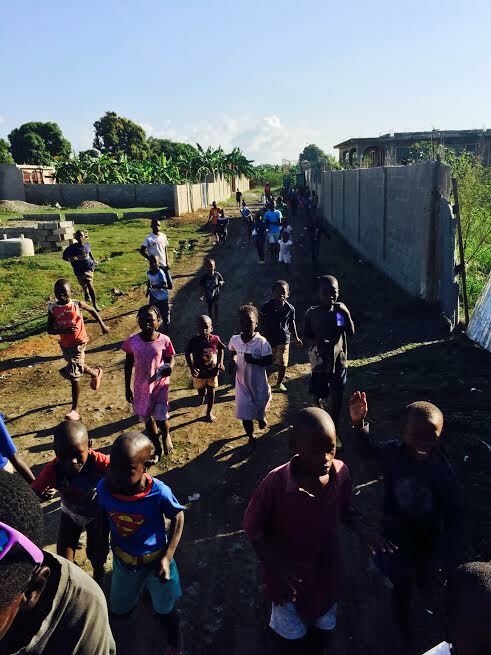 You can understand why the Brooke Fraser song I mentioned in the blog on Haiti brings me to tears: “Now that I have seen, I am responsible. Now that I have held you in my own arms…” Well, I can begin, here, by telling you the story of the day I came face to face with the reality of slavery. But there is so much more that I can do; that we can do. Visit the EndItMovement Website to learn more about the problem of slavery right here in our country and all over the world and how you can be a part of the solution. Remember that this year, slavery will be one of the topics that David Platt will be discussing at Secret Church along with a number of other pressing issues and hard questions in our culture. How do we live in the midst of it all as a light to the world. How do we respond. What is our calling and how do we engage others in purposeful conversations that reflect not just our personal convictions but, more importantly, the love of Jesus Christ. Secret Church is April 24th and we are joining our brothers and sisters in Christ at LEFC for an evening of intense Bible study, worship, and prayer. You do not want to miss it. Visit HERE to sign up or contact me (alweaver@meetgrace.org) if you have any questions. I hope you enjoyed reading the Haiti blogs. God continues to challenge my heart. How do I allow my experience from Haiti to catalyze me towards living “on mission” for Christ each day here at home? How do any of us “press on” towards our eternal calling when the demands of the day-to-day continue to stack up? How do we equip ourselves to effectively engage with the people we rub shoulders with each day, our community, and people we meet wherever we go? Paul writes in 2 Corinthians that God makes his appeal to the world through us. Let’s be thankful for our freedom but may we never take it for granted. We have much to learn from the devotion of our persecuted brothers and sisters all over the world. And on April 24th, we have the great privilege and opportunity to join together with other believers in our community to devote ourselves to an intense time of bible study and prayer for the persecuted church. Here’s what you need to know. Please Register Online. We are so excited that we get to coordinate with a neighboring church for this event. LEFC is providing the location AND the food, so we’d love for some of you to take this opportunity to be a volunteer at this event so show them our appreciation. Sign up to volunteer HERE. Secret Church is a ministry of Pastor David Platt. The Secret Church Simulcast is a time of intense Bible Study, worship, and prayer. It is called ‘Secret Church’ because it mimics how many persecuted Christ-followers around the world meet for hours of study, prayer, and fellowship. These Christians often face great difficulties to meet together, so when they do, they often stay as long as they can to hear God’s word and to study the truth. Often they meet in secret places or house churches, worshipping in hiding, practicing their faith behind closed doors. While we do not have to meet in secret, we can, like them, meet with fervor and desire to learn, to grow, and to go forth and apply what we have learned. Know His Word. Know His Persecuted. The last three posts on Haiti focused a lot on praying for the people of Haiti. 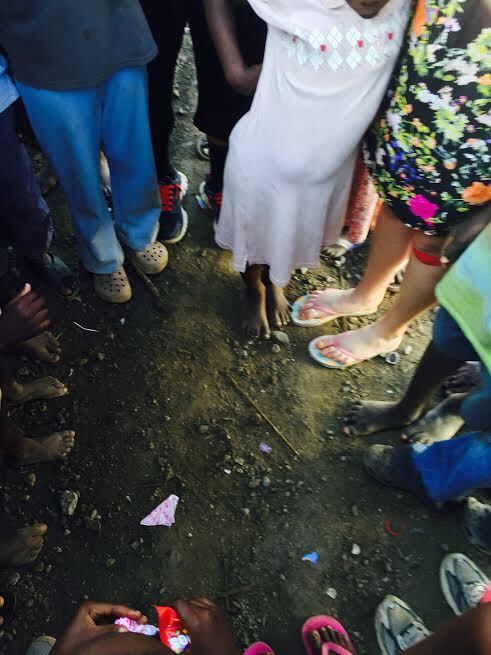 But I’m going to switch gears today and tell you about one of the most powerful moments of our entire week in Haiti. It’s here, pictured above. The final morning in Haiti is a blur, a mass give-away of any remaining candy, toothpaste, soap, shoes, anything handed to the eager hands of the children from the village. The entire week, all that your eyes have seen and heart experiences, ends on this one final note- I won’t lie, it’s chaos. Excitement and survival mingle together, all of the children calling your name, holding their hands out for anything you have to offer. In my first post reflecting on Haiti, I wrote “one thing I learned about Haiti: just as the hurts, the poverty, and hopelessness start to overwhelm, a hidden beauty bursts forth…” That last morning, I was starting to feel overwhelmed again. Small tiny hands reaching from all directions, yet I knew that their requests were so small in comparison to our true desire for them, for their eternity. But even the smallest acts of kindness can open doors for the gospel. As we hugged and said our last goodbyes, our hands emptied and theirs filled for the time being, I felt the hand of one of the young boys on my shoulder. My throat tightened as he led me into the the circle, glancing at one of my team members who looked just as shocked. This was something that has never happened before with our teams to Haiti. There it was: Hidden beauty, bursting forth. There we stood, 50 strong, the village kids and the Haiti team from Lititz. A young man who grew up at House of Hope, Rolex, who now helps at the Institute and is a friend to many of us who’ve gone to Haiti, led the group in prayer. Tiny hands, reaching from all directions to hold ours, resting on our shoulders and legs as Rolex thanked God for their time with us and asked for our safe return home. 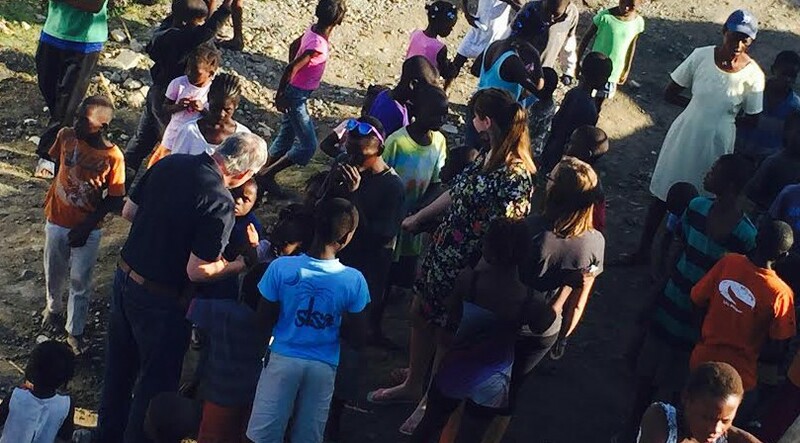 For me, this was the most powerful moment of the trip: receiving the prayers from the children of the village, seeing God at work in their hearts, and in Haiti.